DAVAO City has become the home of immigrants, both permanent and temporary. The welcome these immigrants receive enticing them to come over and stay and enjoy what the city offers to everyone -- the opportunity to grow, learn, and prosper. Among the various ethnic groups, the Chinese and the Indians stand out as among the most numerous. Chinese-Filipino residents are pillars the of Davao city’s economic growth. Primarily immigrants who cling to their culture and norms, tracing their roots to pre-World War II, they have built what is now considered as the country's biggest Chinatown. This area is proudly marked by four majestic archways, “pailou” or “paifang”, welcoming people to the 44-hectare plot that is abuzz with trade. As the cradle of the second generation and third generation Chinese-Filipino or Sinkiyaw, or new migrants, Huakiyaw, Chinatown has become a gateway to the Chinese people's assertion of their identity. Benedicto Lim Jr., a member of the Chinatown Development Council and of the Filipino-Chinese Chamber, said that attaining the oriental look and making the culture and heritage of his people within the confines of the archways is the priority of the council headed by Davao City Sara Z. Duterte-Carpio. 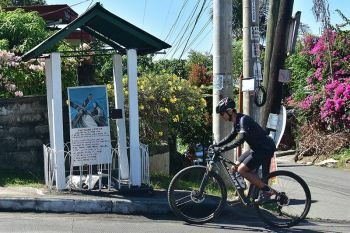 Street signs put up by the Banco de Oro, Metrobank, and Philippine National Bank have Chinese characters and design covering the areas traversed Monteverde Stree, and Ramon Magsaysay and Santa Ana Avenues. Plans of a linear park staddling the Magsaysay Park with distinct Chinese theme has been drawn by the Palafox group. “The projects we do now is to make Chinatown more oriental or visibly more Chinese, because as of now, unlike Ongpin and other parts of the world, the city’s Chinatown is not that defined,” Lim said. “In Binondo, you can see the concentration of Chinoys, at their restaurants, unlike us, where the stores are here, but most of us live in the villages,” he said adding that there are only a few Chinese restaurants in Davao's Chinatown. They're also looking into this, aside from conceptualizing a wishing tree by the biggest arch across Magsaysay Park. A coffeetable book recalling the pioneering Chinese families and how Chinatown came to be is also being written. The Davao Chinatown Development Council organizes the Chinese New Year Celebration. 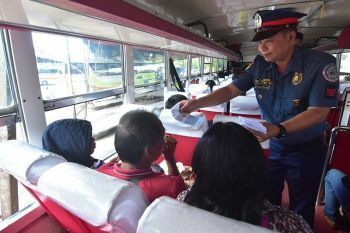 On a regular basis, their community spirit is most manifested in the Filipino Chinese Firefighters Association as they lead in firefighting efforts anywhere in the city. While the Chinese-Filipinos came to stay and fan an economy, a big group of foreign residents are establishing temporary homes in pursuit of their dreams. Roughly around 4,000 Indians are working hard for their dream career here in Davao City as pre-medicine and medicine students. Jeyanth Jeyachandran, a third year medicine student, said that they come to study here because they cannot do so in their own country. “In India, due to huge population, we only have limited seats for (medicine course),” said Jeyanth Jeyachandran, a third year medicine student. It is also very expensive to pursue a medical course in India. “Many of the people in India are not really rich so we need an alternative,” he added. Soundharyaa Nagaraj, a fourth year medicine student, said that students who study here in the Philippines, have higher passing percentage in the Medical Council of India Board Examination at almost 80 percent, compared to those who are studying in other foreign schools. Nagaraj said Davao is also the best choice to learn because the climate and the types of diseases are similar to India. She also likes the safety and security here. “We are free to go around, without any fear, even in midnights. It is really comfortable and safe here,” she said. Davao Medical Education Management Services (DMEMS), which has eight dormitories, is responsible for the food and accommodation of Indian students. Nagaraj said this is an advantage. “Here we have proper management that can take care of us, provide us with accommodation and our Indian food, that is also one of the biggest reasons why Indians choose here,” Nagaraj said. Jeyachandran added that the choice of food is important to them as contrary to common knowledge, they have different preferences depending on their regions and religions. “Many are vegetarians, some should not take beef, some should not take pork,” he said. Local food is not spicy enough, he added. 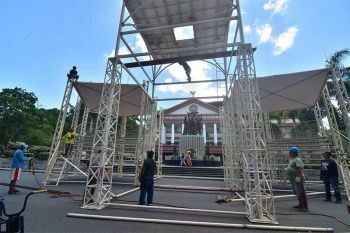 Rizal Park during one day in the Araw ng Dabaw week for years now would transform into a Bollywood center as students showcase their talents in traditional dances, songs, and mimes. They also get to hold their Festival of Colors, the venue of which depends on the participation they are able to gather. Aside from cultural dances, the Indians in the city active in showing importance of Yoga in the community, in fact they are the main participants of the International Day of Yoga, which was launched last June 11, 2018. This event is organized by the Embassy of India, in a bid to promote Yoga in the youth, and stakeholders within the regional areas of the Philippines.